"Before the 20th century, no human had lived through a doubling of the human population, but there are people alive today who have seen it triple. 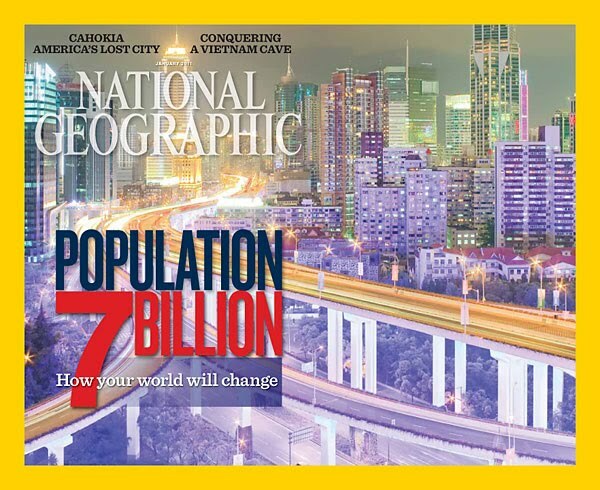 Sometime in late 2011, according to the UN Population Division, there will be seven billion of us. With the population still growing by about 80 million each year, it’s hard not to be alarmed. Right now on Earth, water tables are falling, soil is eroding, glaciers are melting, and fish stocks are vanishing. Close to a billion people go hungry each day. Decades from now, there will likely be two billion more mouths to feed, mostly in poor countries. There will be billions more people wanting and deserving to boost themselves out of poverty. If they follow the path blazed by wealthy countries—clearing forests, burning coal and oil, freely scattering fertilizers and pesticides—they too will be stepping hard on the planet’s natural resources. How exactly is this going to work?"